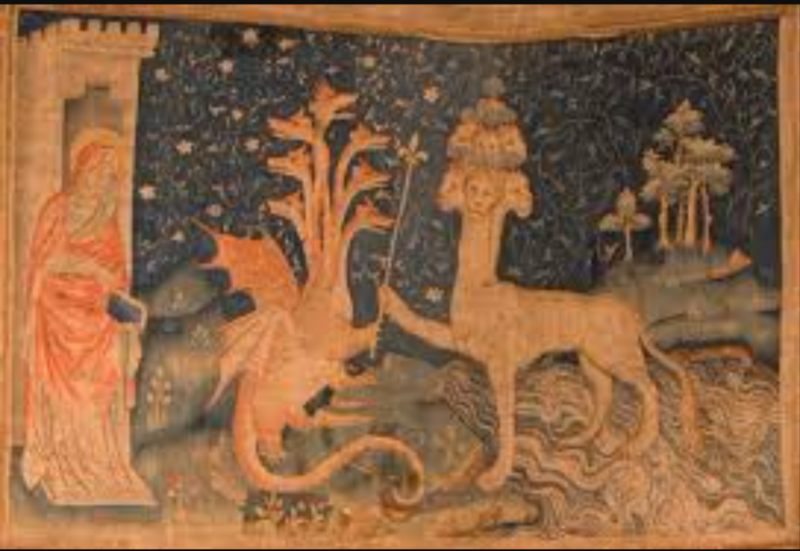 “The beast” or “La Bete de la Mer” refers to a tapestry that depicts two beasts, one from the earth and the other from the sea sharing a flur de lis staff, as Christ looks down on them against a floral night sky. It is called “Tapisserie de l’Apocalypse” and it is in reference to The book of Revelation that tells of the myth of two beasts behind the tapestry. The book describes a lion beast with seven heads, ten horns and ten crowns rose from the sea to meet a second beast that came from the earth with great power. The second was a seven headed dragon that gave the first beast it’s own power, authority and throne for it to rule over the entire world and all it’s people. The beast was to be worshipped and feared, he started wars amoungst kings and hunted down saints or anyone who apposed him or simply did not worship him. The second beast spoke blasphemies against God and waged war against all his holy people, it preformed impressive signs against God such as the appearance of hell fire falling from heaven. All those who followed would receive a mark on their right hand or their forehead and it was the number of the beast’s name; 666. As the tapestry shows Christ watching the untied beasts, he comes down and strikes them down to defeat them. Christ then throws the two beasts into the lake of fire to burn for all eternity.